My intentions are always good when it comes to joining other garden bloggers with longer garden shots and notes at the end of the month. I like this idea which was started by Helen at The Patient Gardener’s Weblog . Spreading (lifting/dividing) small compact Geum around borders just now. One way or another, be it bad weather and no photos or lots of photos and times issues, disappointingly I keep missing this one out. I’ve been on a major garden catch-up during this past hot spell. Last year, parts of my garden saw little attention and I am rectifying this now. 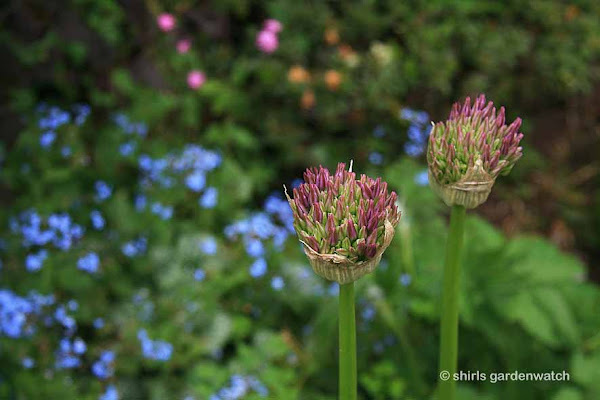 Never tire of Alliums, this two are the larger Globemaster. This past two weeks, plants have been travelling around my garden as I tweak one area of planting and it goes on to affect other areas. I find these mix-ups are what gardening is all about for me. I love the creative play with plants. Red Campion in mixed borders works for me. Need to be quicker in catching the seed pods before they burst though. Weed level is where I’ve been at. 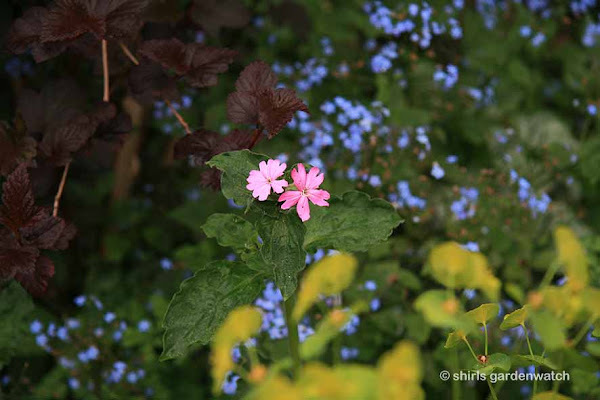 My trusty, rusty wheelbarrow that travelled from my very first garden has travelled all around my garden paths and through borders ferrying plants to new locations and weeds to the green waste bins – I filled two! Looking forward to sowing more grass mounds to edge pond and surround Arbour. Yesterday morning, I went out to grab a few photos (seen on this post) with the intention of getting more border shots later. That didn’t happen and today we had a day of much needed rain – Yay! So, my only end of the month view is of my new wildlife pond area which (all going well) should be completed by the end of next month. Perhaps this view is quite apt for this month as it will see the biggest change. I’m getting quite excited about this now. and that division of a large golden grass looks like it has been successful. Other borders have seen significant change too and once all the plant moving is over I’ll grab some more long shots to compare them at the end of the June too. 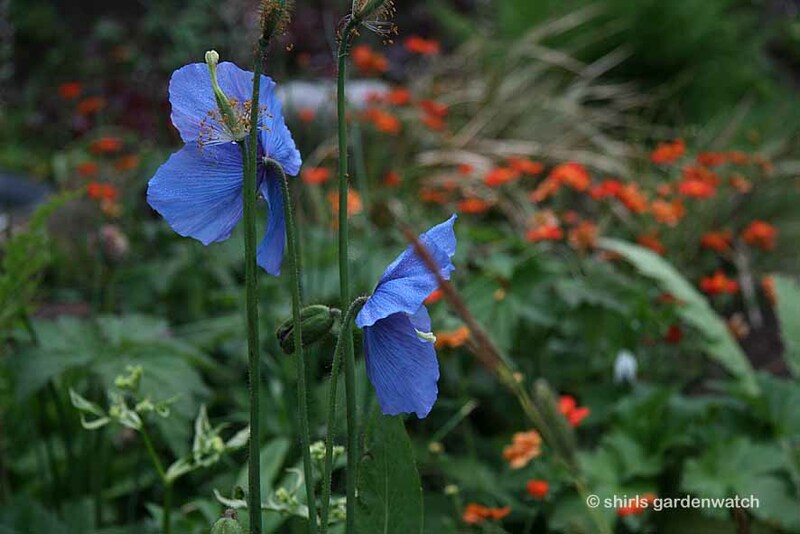 After chatting about my garden’s bird and wildlife visitors for the last 5½ years it has been great to reconnect to the gardener within again. As per usual, my midnight(ish) posting is leaving it a bit late to head over to Helen’s post to read it now (browsed pics earlier) and see posts of others that have joined in/left comments there. I’ll enjoy browsing over breakfast tomorrow. Gosh, is really Friday tomorrow? Gosh, we’re into June too! This weekend it’s the main Garden Show here up in Scotland. 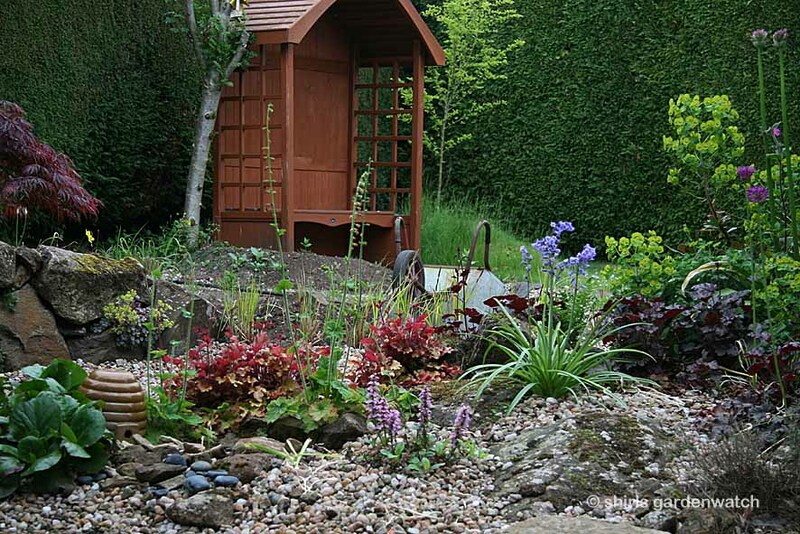 Gardening Scotland runs from Friday 1st to Sunday 3rd of June. We’ll probably take a trip along at some point. I'm not too fussed to see the Show Gardens but I do like to see different planting combinations there and in the Floral Hall. The plant sales tables from nurseries in other parts of the UK I don’t get to visit is a bonus too. Whatever you’re up to this weekend – enjoy. Rain or shine I’ll be out moving plants and come night fall I’ll be keeping an eye on the cam in Hedgehog Manor which has also seen a change of location recently. Tonight it has been both busy and boisterous with two hogs in at the same time and one bulldozing the other into a corner. Four hedgehog sightings were seen tonight. This post was written by Shirley for shirls gardenwatch in May 2012. Envious of your hedgehog activity - we had a regular visitor every night last year so I bought a Hedgehog House and haven't seen one since! Your garden is looking great. The Acer looks really happy. 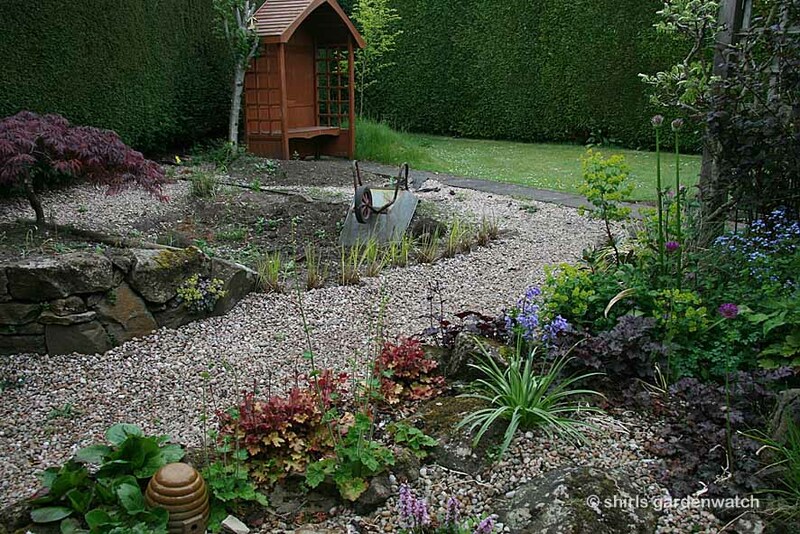 Like how the wheelbarrow has been left there, it's got gardening in progress written all over it. Hello everyone, thanks for your comments. Gosh I’ve just jumped from the end of the month to the middle of June! Lovely photos Shirl. I love the blue and orange in the first one, very striking! What is the white stuff on my box plants?